It is being reported at the UK Daily Mail, that Fariq Abdul Hamid, the co-pilot of flight MH370 tried to make a call from his mobile phone after the plane had turned right and vanished from radar. The call was made as the aircraft flew low over the west coast of Malaysia; however, was ‘was abruptly cut off’. Was this a desperation call from the co-pilot? The co-pilot of missing flight MH370 made a call from his mobile phone while the aircraft flew low over the west coast of Malaysia, it was revealed today as the U.S. denied reports the plane landed at a military base on the remote island of Diego Garcia. Investigators have learned that the call was made from Fariq Abdul Hamid’s mobile phone as the Boeing 777 flew low near the island of Penang, on the north of Malaysia’s west coast. The New Straits Times reported the aircraft, with 239 people on board, was flying low enough for the nearest telecommunications tower to pick up Fariq’s signal. The call ended abrupty, however it has been learned that contact was definitely established with a telecommunications sub-station in Penang state. 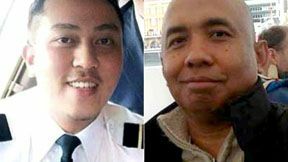 New Straits Times - Call traced to co-pilot’s phone. A CREW member of Malaysia Airlines flight MH370 made a desperate call from his mobile phone as the plane was flying low near Penang, the morning it went missing. The latest breakthrough in the ongoing criminal investigation traced the source of the call to co-pilot Fariq Abdul Hamid’s phone. The New Straits Times has learnt that investigators are poring over this discovery as they try to piece together what had happened moments before the Boeing 777-22ER twinjet went off the radar, some 200 nautical miles (320km) northwest of Penang on March 8. “The telco’s (telecommunications company’s) tower established the call that he was trying to make. On why the call was cut off, it was likely because the aircraft was fast moving away from the tower and had not come under the coverage of the next one,” the sources said. 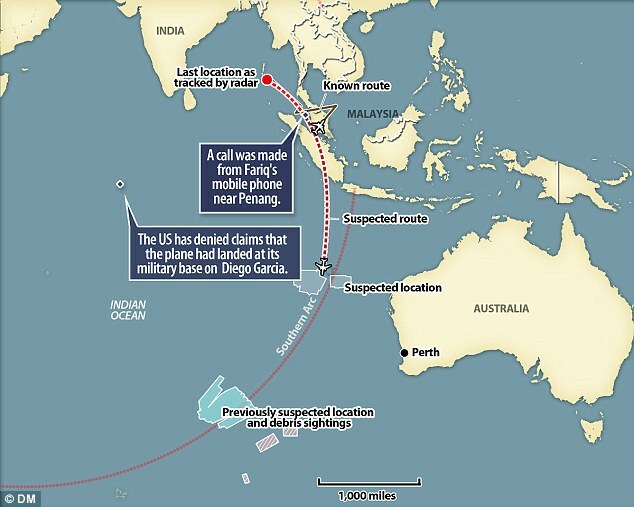 New Straits Times – Timeline: The Hunt for MH370. Could they finally have found missing Malaysia Flight 370? It might just be the break that searchers have been looking for, have they finally found the needle in the middle of the Indian ocean? A crew on board a New Zealand military plane has spotted several objects in the Indian Ocean west of Perth. The sightings would need confirmation by ship, which is not expected until Saturday, according to the Australian Maritime Safety Authority. Crew on board a New Zealand military plane has spotted several objects in the Indian Ocean west of Perth, reports BBC. Surveillance ships will likely reach the area by Saturday. Malaysia Acting Transport Minister Hishammuddin Hussein said that the focus right now is to reach the debris sighted by the satellites so that it can be identified if the debris sighted is of MH370 or not. He also said that Malaysia will follow all possible ways to find the ‘black box’ of the missing plane. Breaking … Australian Prime Minister Tony Abbott is saying that satellite images may be showing wreckage of missing Malaysia Flight 370. Abbott said that authorities have spotted two objects in the Indian Ocean that are possibly related to the search for missing Malaysia Airlines Flight 370. Royal Australian Airforce Orion has been diverted to the area to attempt to locate the objects. The Orion is expected to arrive in the area Thursday afternoon. It is hard to imagine that this is not very credible finding seeing that the Australian PM has made the announcement. AMSA media conference is scheduled for 3.30pm (AEDT) … Mediaite has live stream of press conference. Australia’s prime minister says objects possibly related to the missing Malaysia Airlines flight have been spotted on satellite imagery. Prime Minister Tony Abbott told Parliament in Canberra on Thursday that a Royal Australian AirfForce Orion has been diverted to the area to attempt to locate the objects. 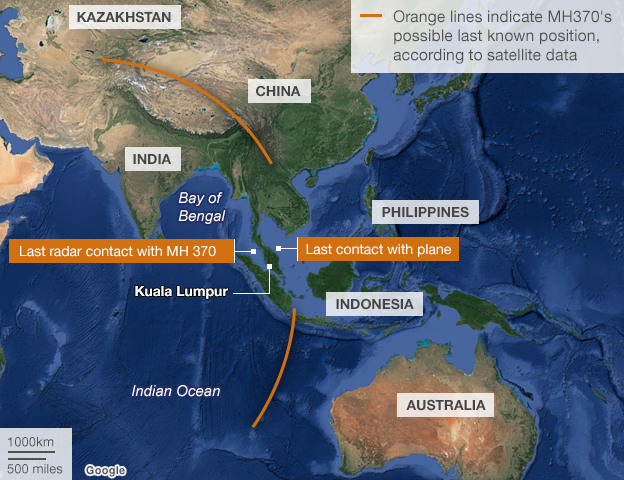 UPDATE I: ABC News: Missing Malaysian plane: Australia checking 2 objects in search for plane. Prime Minister Tony Abbott told Parliament in Canberra on Thursday that a Royal Australian Airforce Orion has been diverted to the area to attempt to locate the objects. The Orion is expected to arrive in the area Thursday afternoon. Three additional aircraft are expected to follow for a more intensive search. 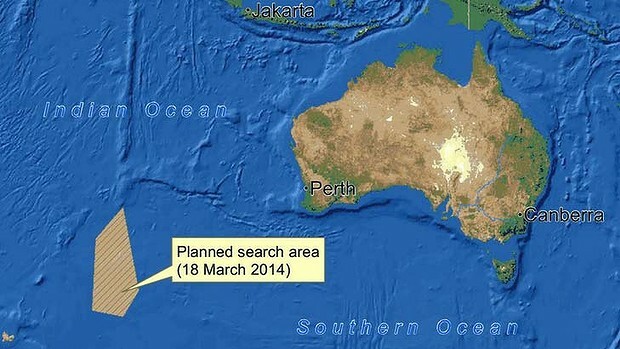 UPDATE II: CNN: Malaysia Airlines Flight 370: Australia says possible objects in Indian Ocean. “New and credible information has come to light in relation to the search for Malaysia Airlines flight MH370 in the southern Indian Ocean,” Abbott said in the the Australian House of Representatives in Canberra. “The Australian Maritime Safety Authority has received information based on satellite imagery of objects possibly related to the search. Three other planes will carry out a “more intensive follow-up search,” he said. Australian search teams have been at the forefront of the hunt for the missing plane in the remote southern Indian Ocean. The announcement from Abbott raises hopes of finding parts of the plane after a search that is now in its 13th day. Previous reports of debris found in the sea have not turned out to be related. UPDATE III: Sydney Morning Herald: Missing Malaysia Airlines flight MH370: PM Tony Abbott says satellite images could be wreckage of crashed plane. “The Australian maritime safety authority has received information based on satellite imagery of objects possibly related to the search,” Mr Abbott said. “I should tell the House – and we must keep this in mind – the task of locating these objects will be extremely difficult and it may turn out that they are not related to the search for flight MH370,” Mr Abbott said. UPDATE IV: ABC News: Search for Missing Malaysia Airlines Flight 370 Drastically Narrows. British and American officials have narrowed the search down to two possible flight paths of missing Malaysia Airlines Flight 370. For more updates, provide your comments and theories and to read others, go to Scared Monkeys Missing Persons Forum: Malaysia Airlines 777 Flight MH370 – Missing – March 7, 2014. 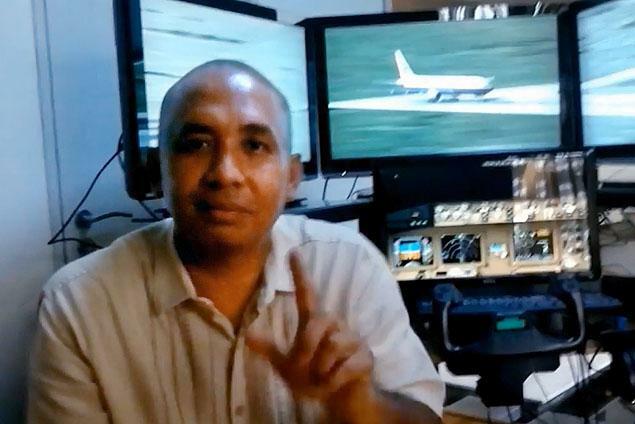 As if the disappearance of Malaysia Flight MH370 was not bizarre enough, now we are getting an image of one of the pilots and it does not look good. The image many of us want for those flying a plane is one of normalcy, stability and calm. However, that is hardly the one that is emerging of one of the pilots. 53 year old Captain Zaharie Ahmad Shah was said to be a ‘fanatical’ supporter of the country’s opposition leader Anwar Ibrahi. The pilot of the missing Malaysia Airlines jet wearing a T-shirt with a ‘Democracy is Dead’ slogan. It has also been revealed that the pilot’s wife and three children moved out of the family home the day before the plane went missing. including Capt. Zaharie Ahmad Shah, seen here with his home flight simulator in a YouTube video. An image has emerged of the pilot of the missing Malaysia Airlines jet wearing a T-shirt with a ‘Democracy is Dead’ slogan as it has been revealed he could have hijacked the plane in an anti-government protest. Captain Zaharie Ahmad Shah, a father-of-three, was said to be a ‘fanatical’ supporter of the country’s opposition leader Anwar Ibrahim – jailed for homosexuality just hours before the jet disappeared. It has also been revealed that the pilot’s wife and three children moved out of the family home the day before the plane went missing. It comes as FBI investigators say the disappearance of MH370 may have been ‘an act of piracy’ and the possibility that hundreds of passengers are being held at an unknown location has not been ruled out. Captian Shah was an ‘obsessive’ supporter of Ibrahim. And hours before the doomed flight left Kuala Lumpur it is understood 53-year-old Shah attended a controversial trial in which Ibrahim was jailed for five years. Police sources have confirmed that Shah was a vocal political activist – and fear that the court decision left him profoundly upset. It was against this background that, seven hours later, he took control of a Boeing 777-200 bound for Beijing and carrying 238 passengers and crew.